DALLAS, TX -- (Marketwired) -- 04/03/14 -- Parks Associates today announced just-released research that provides in-depth analysis, competitor profiles, business model strategies, trends, and forecasts for product and service ecosystems serving the connected consumer. 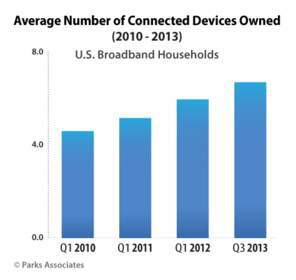 Currently 75% of U.S. homes have broadband, and over 80% of these households have a home network. Over 60% own connected CE, including over 80% of consumers 18-34, and the average household has nearly seven connected CE devices. "Consumers no longer evaluate connected home products and technology solely on functionality but on overall experience, which is driving greater demand for innovative connected technology and services in the digital home," said Stuart Sikes, President, Parks Associates. "Our research addresses the trends, new opportunities, and recommendations on dealing with challenges as companies add connected home solutions to their offerings." TV Everywhere 2.0: The Next Steps in Multiscreen analyzes TV Everywhere services, assesses the future for multiscreen services, and provides forecasts through 2018. OTT in a Pay-TV World examines consumption of and attitudes towards OTT services, business models and content licensing issues, and moves by operators to offer pure OTT services to consumers who are not their pay-TV subscribers. Evolution of Digital Music on Connected Devices analyzes the market for network-connected music devices and provides insights into the technologies and driving forces behind the growth of this market. Leveraging the Cloud for Home Energy Management analyzes business strategies for cloud-based solutions in this market, including the adoption of smart home technology and connected devices as well as strategies enhance the traditional utility business model. The Set-Top Box: Thick or Thin Client? analyzes technology, market, and consumer trends impacting operator-provided set-top boxes and implications of current consumer research on the future of set-top boxes. Parks Associates will address these topics at the firm's 18th annual CONNECTIONS: The Premier Connected Home Conference, May 13-15, 2014, in San Francisco. CONNECTIONS, with keynotes from iControl Networks, AT&T, ARRIS, Lowe's and Cisco Systems, features sessions on emerging technologies and business models for the entertainment and smart home industries. For information, contact [email protected], 972-490-1113.